The purpose of fences is to provide security and demarcate a property area but before installing a fence you need to consider some factors that will demand your attention later if not considered prior to selecting an appropriate design. Every fence has a different purpose and advantages depending on suitability, budget and other factors as explained below. Chain link fencing is a common near-ornamental design for commercial and residential fences. It is made of coated steel wire with an interlocked design that makes it cat proof too. Usually cats are the most flexible animals to enter even through the narrow barred fences. Cost Effective: The biggest advantage of chain link fences design is that it is cost effective and reliable when it comes to security and maintenance. This design allows you to have gates too so, that saves you additional expense. Customized Designs: What better than customizable wire meshes design with options of varied wire thickness and color variety too to suit your exterior décor too? So, depending on whether you run a preschool nursery, you can opt for a bright color and thick coated chain fence. Quick Installation: Most commercial properties choose this fence design because they are really fast and easy to install, be it at whatever height and for how much ever big area. The interwoven wire or mesh wire is actually rolled and one just has to unroll it for installing it while fastening. No Maintenance: Install chain link fence if you don’t want any maintenance issues apart from may be just pruning off the small creepers growing off the lawn on and off! You don’t need to worry about painting or cleaning it either. The best part of this fence type is that it is coated for dealing with oxidation reactions. No Light Obstruction: Imagine having a secured fence and yet no requirement of putting extra lights around the property. By virtue of its design and material, the chain fence provides full visibility and no light obstruction. Trespassing: This is a punishable yet common offence and often difficult to penalize. Why take the trouble to catch someone red hand while trespassing your property for plucking flowers in your beautiful garden? Instead, simply contact the fence installation service and deal with it easily. Pet Containment: Do you like your dog being chased by strangers passing by and troubled by the neighborhood kids? Well, you need a chain link fence to evade these pet issues. The wired mesh design provides visibility (you and your dog can see what’s happening outside) and security too. 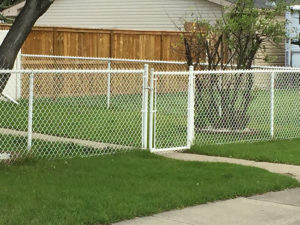 These points surely make chain link fences design a viable option for your commercial or residential property when compared with the costlier counterparts like vinyl or wood fences but the purpose of the latter is different altogether, for example, beautifying and adding a classy tough. So, if beautifying is not your motive, choose the thickness and color of the wire properly to match it with your external space.